From 1983 to 2016 Dungeons & Dragons have moved from Advanced Dungeons & Dragons 1st edition (and D&D becmi) to Dungeons & Dragons 5th edition, and it is more than just a streamlining of the rules and development of the rules, that has taken place. Recently I have been playing Curse of Strahd (2016) and I6 Ravenloft (1983), and therefore I will show how the game has developed from the early 80’s to the present through a comparison of an encounter or location, that appears in all versions of the adventure. 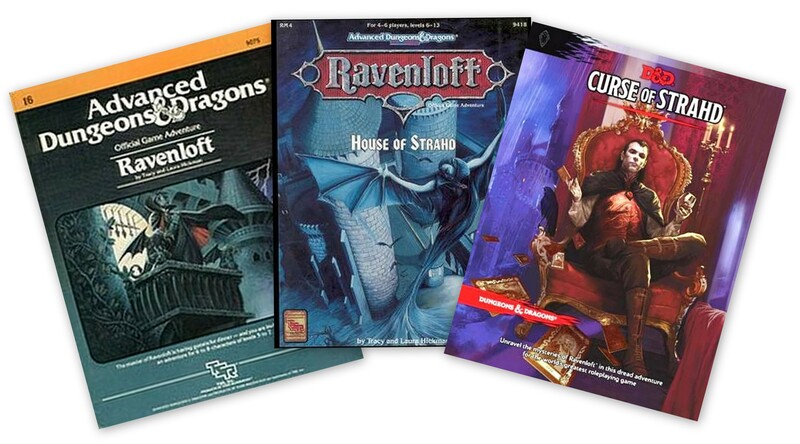 Originally published in 1983, the Ravenloft adventure was relaunched as House of Strahd in 1993, where it was adapted to both Advanced Dungeons & Dragons 2nd edition and the Ravenloft setting. Again in 2006 it was published, this time as Expedition to Castle Ravenloft, this time adapted to D&D 3.5, and then finally in 2016 it was launched as a campaign module, Curse of Strahd, in 2016 for D&D 5th edition, where the original castle was made a part of a much larger campaign, where the whole valley is explored. In the castle is a sequence, where a set of plate armor equipped with a halberd springs forth to frighten people. The armor is not animated but is rather a jump scare showcasing the original adventures curious mix of gothic horror and campy horror tropes, as the armor might be right out of an episode of Scooby Doo. So, let’s see how different versions of the adventure deals with this sequence. As is clear from the text, the armor is set up as a cruel joke, which is recurrent in the later versions of the text. Where the sequence differs is how game mechanics handles the event. There is a mere 60% risk, that the trap is sprung, and 25% chance that 1d4 hit points are lost. This may not sound like much, but for an AD&D character, this loss might still be felt, as hit points and healing resources are less than in later versions of the game. This time the armor is automatically triggered – and is considerably more fun, as triggering the ‘jump scare’ is more fun, than the event never happening. Another difference is that the armor is now making an attack roll rather than checking for the risk of getting hit. 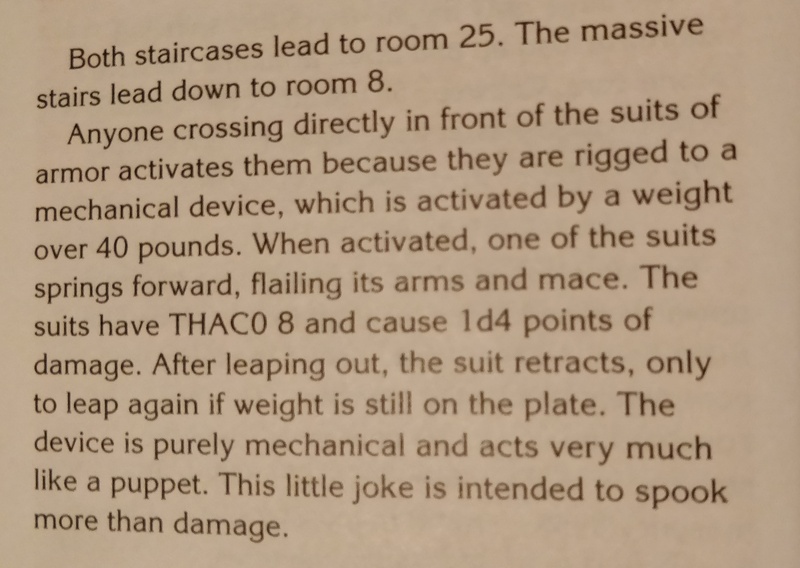 THAC0 8 is a rather high chance of hitting its victim, but at least the damage remains at 1d4 hit points. In this version the armors are changed from something happening during the exploration of the castle and has instead become an encounter, where the adventurers fight the two armors, that has become animated monsters assisting the vampire Strahd in an encounter. This change is significant, because it shows, where D&D was headed in 00’s with D&D 3.5 and D&D 4th. Basically D&D was unable to do things, that was not an encounter, and an encounter is in general always some sort of combat. D&D was broken into units of combat with D&D 3.5 and 4th (the fourth edition just finalized, what D&D 3.5 had already begun). The amount of text has grown considerably, but the game has returned to its roots, or at least it has abandoned its encounter structure, and made it possible to play strange little happenings again, but the game suffers from a desire to put rules and explanations onto everything. Another interesting change is that now the players are rolling the dice – a saving throw is made by the player instead of an attack roll or a percentage roll by the DM – and damage has increased rom 1d4 to 2d6 to reflect the increase in hit points in the game. I do appreciate the return in 5th edition to a structure closer to the Advanced period (1977-2000), but there is still a needless amount of mechanics and rules cluttering the text, instead of just letting the GM run the scene. 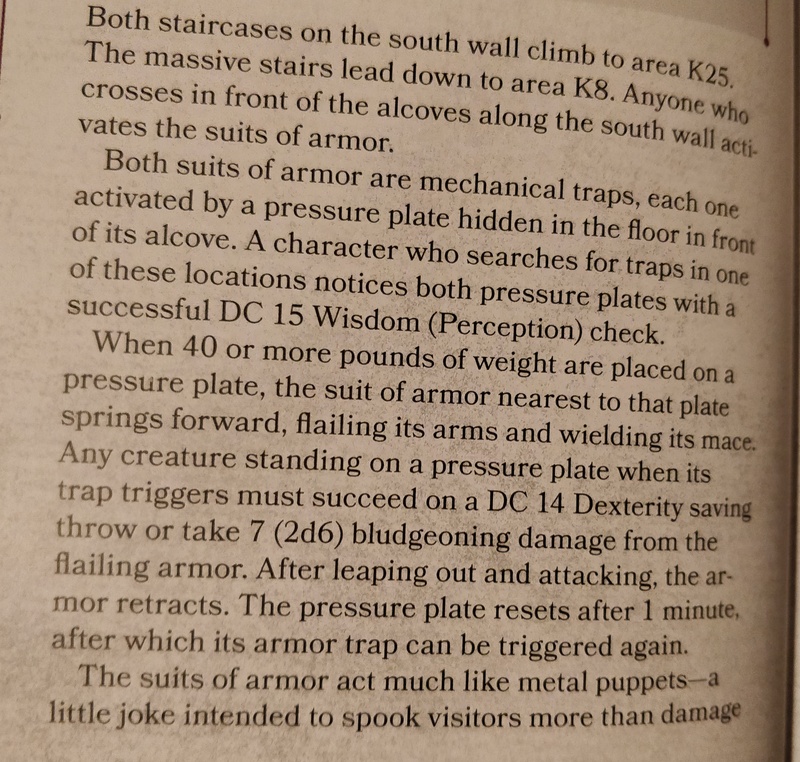 What is missing from all versions of the module is some good advice for the DM as to how to run the scene, for it is not really important whether or not the armor hits one of the characters for a small amount of damage, but rather it is of importance whether or not the it is run as a jump scare, and my advice is to play the scene with a low voice quietly describing the stairs, and as the characters either pass by or moves in to look closer at the armor IT SUDDENLY SPRINGS TO LIFE, AS THE ARMOR JUMPS TOWARD YOU! THE POLEARM FLIES TOWARD YOU STOPPING MERE MOMENTS FROM YOUR FACE!!! While you either emphasize this with hitting the table with the flat of your hand, or lunges quickly toward the player. The sudden shift in your behavior can easily make your player jump in their seat, thus recreating the campy jump scare of the adventure (and yes, that is how I played the encounter, and yes, the player did jump in his seat, and yes, I try to use only sparingly, so it works better, when used).